Everybody loves an Irish themed online slots games. The opportunity to lose yourself in an emerald 3 reel alongside a delightful, little leprechaun is one that cannot be missed. This Irish game, however, is slightly different from the rest. Spin through 3 reels of traditional fruit machine symbols on a game that uses some amazing graphics to depict the game as if it’s on an actual one-armer in the pub. Top of the morning to you. WGS Technology Casinos (formerly known as Vagas Technology Casino Software) once powered the leading brands of casinos such as English Harbour, Millionaire Casino, Superslots, Caribbean Gold, Slots Galore, VIP Slots and Silverdollar Casino before their departure from their industry. The WGS Casinos believe they produce thje same strong, respectible brand as the prebious company, delivering top quality casino games and sites such as Liberty Slots, Lincoln Casino, Miami Club, and Red Stag Casino. They are known for being the leading choice of casino brands for players throughout the USA. If you want some slots promotions then Easyslots.com has loads on offer! 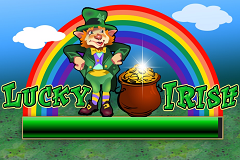 Lucky Irish is an online uk slot game made by WGS and the game used a slot machine layout with good amount of Irish references added. The game has simple rules, is fun to play and if you're one of those lucky players there are a few surprises that come with the high stakes. 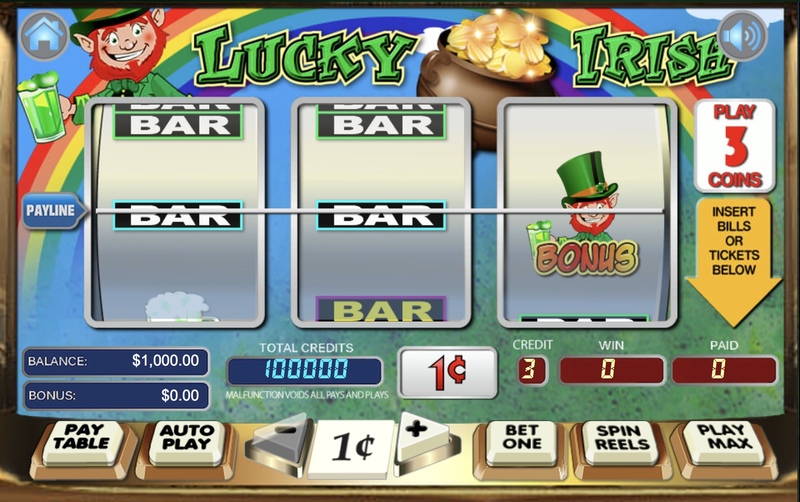 Lucky Irish is similar to other WGS creations and it includes a slot machine with a significant paytable on top. You can also see the background of the slots machine. The game is obviously themed around Leprachauns and their pot of gold, with a rainbow running behind the game itself. The game only has 3 reels and one payline. Any combinations that land on that payline will be valid in earning you a cash prize. In order to play you must set your wager and the number of coins you would like to use. The player can bet a minimum of £0.01, and a maximum of £10. The player can choose to bet either 1, 2 or 3 coins per spin, with the rewards depending on the size of your wager. You can use the left and right arrows on the bar at the bottom of the screen to choose your individual coin value then click on the “spin reels” button when ready. If you enjoy taking risks and want a fast paced game you can try the auto spin mode which makes the reels place your bet and spin on their own for as long as you let them. This is an odd feature as most games make the player choose a definite amount of turns for the autospin to last for, or have conditions causing the reels to stop (e.g. hitting the jackpot). Learn more how to deposit by mobile at EasySlots.com. There are various winning combinations such as: Bar signs in single, double and triple size, pots of ale, pints of gold and four leaf clovers. The most valuable combination is the pig of gold one and then majority of winning combinations include 3 identical symbols. The games Bonus symbol is the lucky leprtechaun himself, and if the player manage to get 5 of them, the player will get the jackpot! Lucky Irish is a great game for beginners and experienced slots players alike. This game is exciting, rewarding and certainly very fun to play if you're bold and like to take risks. If you keep at it and believe in the luck of the irish, who knows. You might just get lucky. Deposit and Spin today at Easy Slots.